Arugam Bay (Arugambay or A-bay) is a surfing wonderland located on Sri Lanka’s East coast. The small beachside town is the home of surfing in Sri Lanka, and with good reason too: the bay is both visually stunning and hosts undoubtedly Sri Lanka’s best point break (at least that the world knows about). The bay spans about 5km, beginning near Pottuvil in the North, extending South past the Arugam Lagoon bridge and towards the world famous right hand point break at the Southern tip. Unlike the more traditional town of Pottuvil, Arugam Bay is geared up for tourists, with plenty of accommodation (from backpacker digs through to highly rated Hideaway Resort). During the high season (May to September) the town is buzzing with surfers, yoga fanatics, and local holiday makers. Despite the heavy tourist present, Arugam Bay is still a working fishing village with boats going out almost every day to bring in the days catch. Watching the fishermen launch their boats up the beach at high speed in the evening is a must! There are not many point breaks in the world that are as accessible as Arugam bay. The right-hander caters to both beginners and experienced surfers: when the swell is pumping, the most Southern section will reward seasoned surf travelers with fast, clean sections, while further down the line, more mellow rollers cater to those trying surfing for the first time. Upali Beach Resort is right next the main break and has a selection of surfboards to rent for about Rs800 a day. It’s also a great spot to sip on a coconut or beer between sessions. The wind usually comes up during the day, making conditions a bit bumpy. In general the best times to go are at dawn and dusk. There are loads of other waves around the Arugam Bay area (Peanut farm to the South and Whiskey Point to the North are the closest) which are worth exploring as well, but A-bay’s reputation for quality waves is well earned. Away from the hustle and bustle of Arugam Bay, Whiskey Point is an isolated oasis. 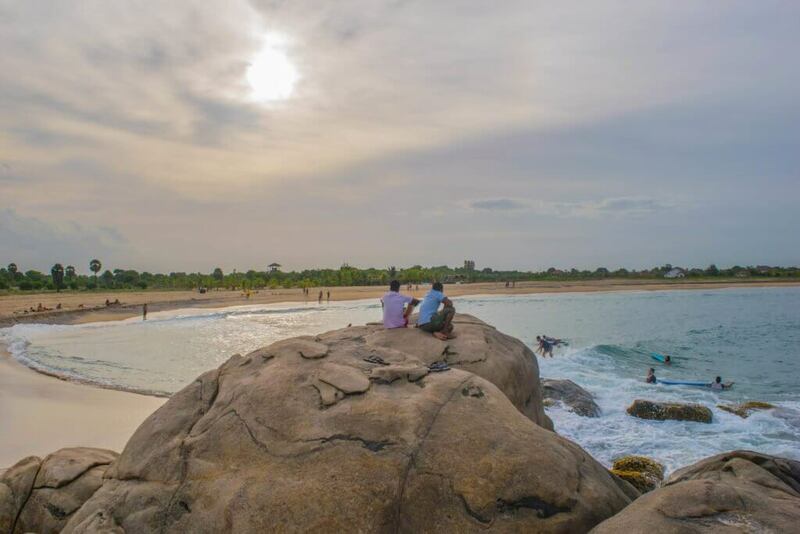 Located about 20mins drive north from Arugam Bay, Whiskey Point offers breathtaking views over the Indian Ocean in a tranquil and rock dotted landscape. Although whiskey is widely available in Sri Lanka, the local ‘arrack’ is a more appropriate beverage. A tuktuk to Whiskey Point and back for 2 hours should cost no more than Rs1,000. There’s also a pretty good right hand point break here as well. Make sure you get there early though; it’s not as well kept a secret as it used to be! Inland and North from Arugam bay, Lahugala Sanctuary is a little known area rich in Sri Lanka’s famous wildlife; crocodiles, elephants, monkeys and exotic birds are abundant! 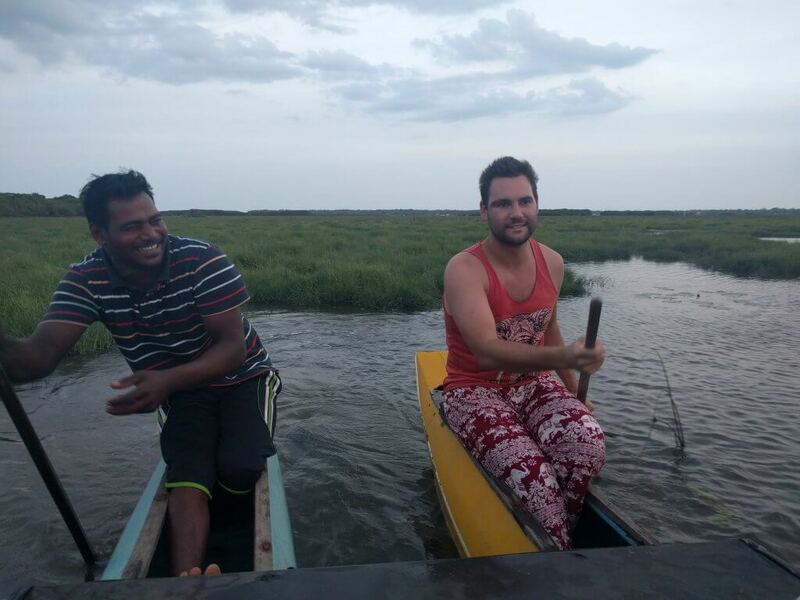 Unlike the other national parks which require guided tours in decked out jeeps, the best way to explore Lahugala and its inhabitants is via the backwaters on a local’s canoe. These trips aren’t advertised widely, but anyone working at your accommodation will be able to organise it for you. The going rate is about Rs1,500 per person. 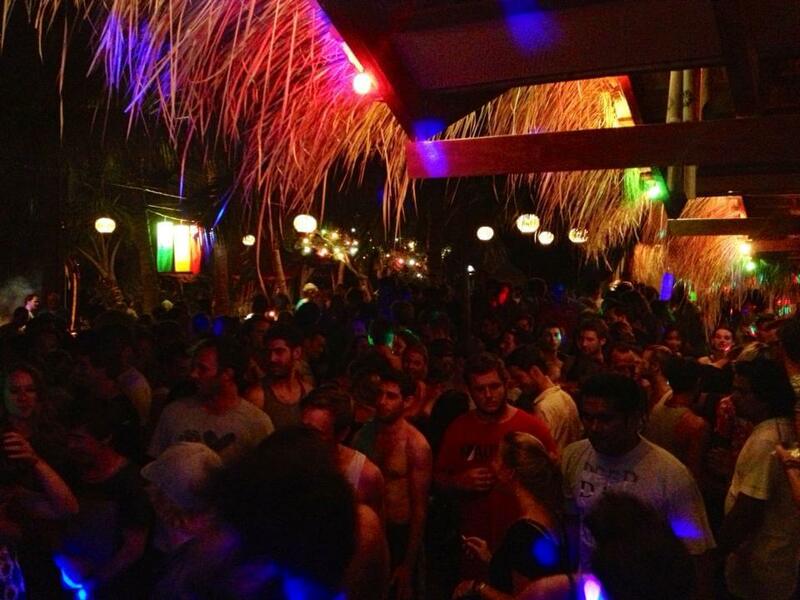 Mambo’s is an institution in Arugam Bay. Located on the beach halfway out to the point, it offers a range of accommodation options, but is famous for its raging beach parties. The beach bar is quite busy on most nights during peak season, but every two weeks or so, they take it up a notch and turn it on for young and old! Mambo’s is not just a favourite for partygoing backpackers, but also draws a big local crowd, offering tourists a chance to get to know their hosts over one or ten beers. The home side usually out parties the tourists though; they’ll still be dancing well into the morning the following day! If you’re not much of partygoer, it’s still worth taking note of when the big parties are happening: the crowds are decidedly smaller in the surf the next morning! 5. Rent a tuktuk and go exploring! If you’re looking for the freedom to explore the surrounding region, look no further than the steed of the subcontinent, the trusty tuktuk! These three-wheeled beasts are easy to drive and will transport you in style to some of the more secluded places. There a some locals in A-bay that will rent you their tuktuk for the right price, usually about Rs3,000 per day. Renting informally, however, should be done with caution: the vehicles typically won’t be insured for you to drive and you won’t have the right licence. 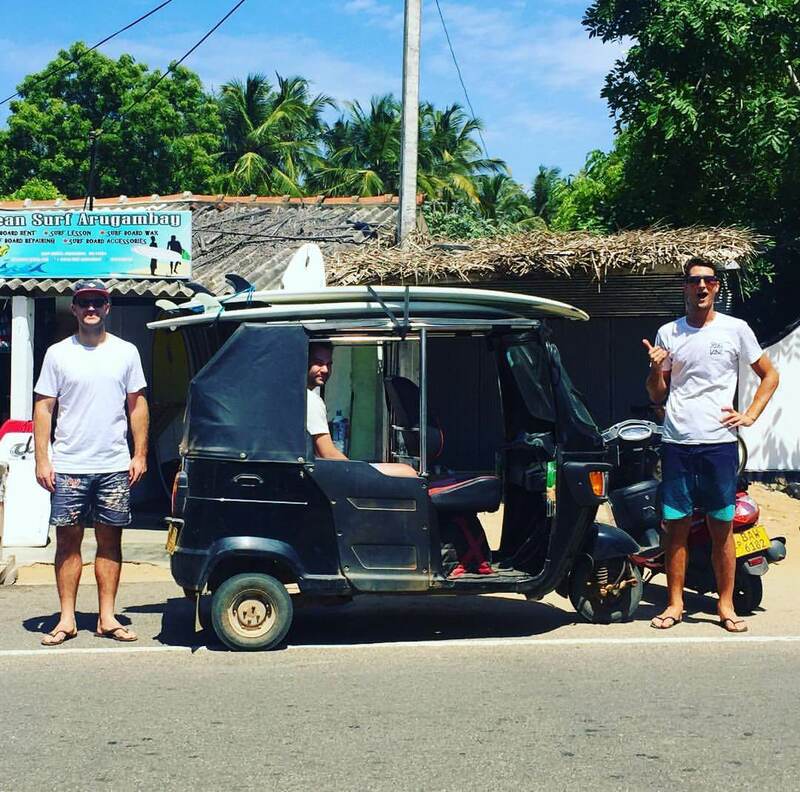 If you want to explore Sri Lanka via tuktuk and keep it legit, TukTukRental.com will set you up with a tuktuk with full comprehensive insurance and organise a local tuktuk licence on your behalf!